AIC registered formulas are available to OEMs as private branded products for sale through US and Canadian distributors in a variety of market segments. Only AIC offers private label programs with True One Minute™ formulas, enabling OEMs to compete effectively with industry giants. 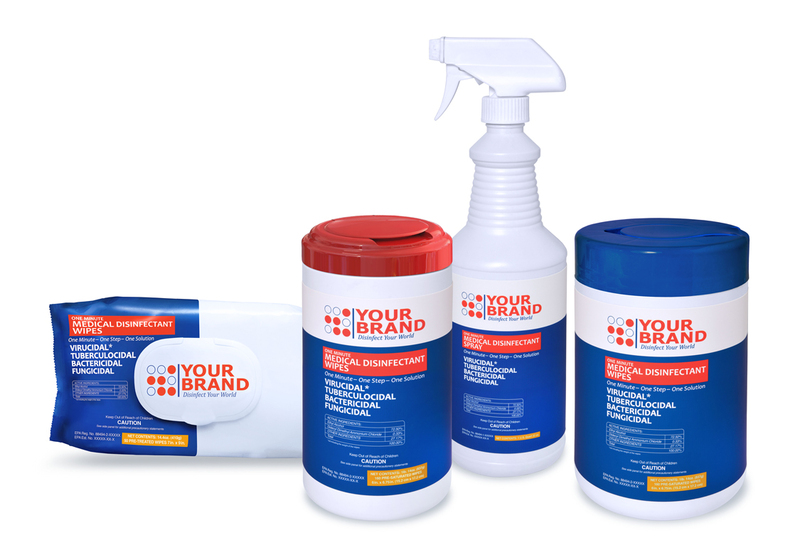 AIC produces One Minute Disinfectants in a variety of wipe and spray formats to meet all user needs. The AIC One Minute Formula kills all categories of pathogens, including enveloped and non-enveloped viruses in ONE MINUTE in ONE STEP; a claim that very few other products can make. AIC does not sell directly to end users.We produce private label products for OEM’s that wish to enter the disinfectant field. AIC will not undercut OEM’s in any market channel. AIC ensures competitive pricing, utilizing state of the art manufacturing facilities offshore and domestically. AIC produces disinfectant wipes in several domestic USA plants and in Istanbul, Turkey. All AIC authorized manufacturing plants are registered and licensed US EPA facilities. Our global reach allows AIC to manufacture disinfectant wipes at the lowest cost base available for contract manufacturing. This allows our OEM customers to compete favorably in US markets with decent profit margins. AIC’s minimum order quantities are not prohibitive to entry-level organizations looking to penetrate the market. Minimum order quantities for domestically produced wipes and spray disinfectant are 500 to 1500 cases per run, depending on the product. Minimum order quantities for disinfectant wipes produced offshore are 1250 cases per run. Unique Formulas EPA registered proprietary formulas that are faster, kill more pathogens, are more user friendly, and are far more compatible with surfaces. Cost Highly competitive pricing that enables major market penetration. Product Acessibility Domestic and offshore production partners that provide workable minimum production runs in EPA registered plants. OEM Support AIC does not sell against its OEM customers. AIC wll not undercut its clients in the marketplace. Value Added Services EPA regulatory expertise, product design, label design and compliance.